Expansion of power sector to cater increasing electricity demand, construction of large-scale commercial projects, strengthening of non-oil sectors as well as infrastructure development activities for upcoming mega events such as World Expo 2020 and FIFA World Cup 2022 would be some of the key drivers behind the growth of the Middle East Recloser and Load Break Switch market during 2018-24. According to 6Wresearch, Middle East Load Break Switch and Recloser Market Sizes are projected to grow at a CAGR of 6.7% and 5.5%, respectively during 2018-24. Sustained construction and industrial development activities coupled with rising electricity demand from the residential and commercial sectors would increase the demand for power in the Middle Eastern region which in turn would drive the market for recloser and load break switches. Additionally, government plans such as Saudi Vision 2030, Qatar National Vision 2030 and Dubai Vision 2021, Middle East Load Break Switch and Recloser Market Forecast period revenues are anticipated to increase. Saudi Arabia, Turkey and UAE captured majority in Middle East Load Break Switch and Recloser market share in 2017 and would continue their dominance during the forecast period on account of increasing electricity demand and upcoming mega infrastructure projects such as Neom, the Red Sea Project, Abu Dhabi's Barakah nuclear-power plant and Osmangazi Electrik Dagitim (OEDAS). Middle East Load Break Switch and Recloser Market Report comprehensively covers the Middle East Load Break Switch and Recloser Market by voltage types, applications, end users and countries. The Middle East Load Break Switch and Recloser Market Outlook report provides an unbiased and detailed analysis of the Middle East Load Break Switch and Recloser Market Trends, opportunities/high growth areas and market drivers which would help the stakeholders to device and align their market strategies according to the current and future market dynamics. •	Historic data of Rest of Middle East Load Break Switch and Recloser Market Revenue 2014-2017. 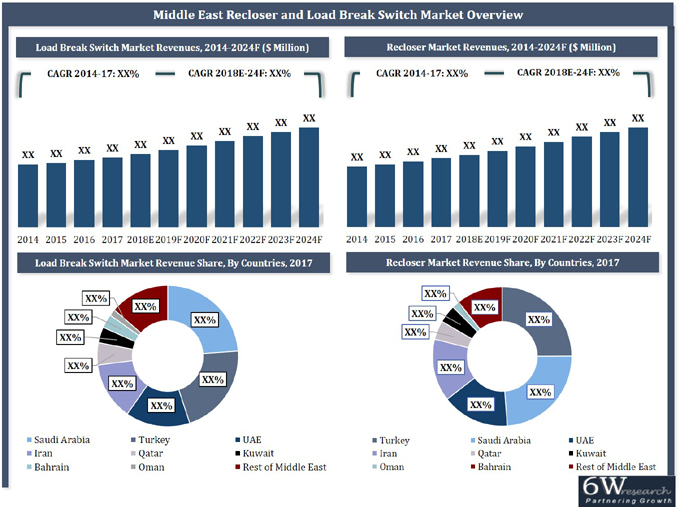 •	Market Size & Forecast of Rest of Middle East Load Break Switch and Recloser Market Revenue until 2024.